Smartphone’s these days are so much more than just communication devices. A smartphone can be your camera, your media center, your gaming console, or even your personal fitness trainer. Fitness apps really help out if you are trying to get in shape. The key is to find the right one that will match your style. There is a wide range of fitness apps available these days. You have your trackers, nutritional diaries, workout guides, and so much more. Here we are going to list the very best third party fitness apps that will help you shape up. We hope that our list will help you pick out a fitness app to help with your fitness routine. Some of the apps listed here are health and fitness trackers.These apps will allow you to log workouts, count calories, and collect stats about runs, walks, and bike rides to see over time how you’re improving. Fitness apps can also be coaching apps that put you in touch with a personal trainer or nutritionist who will check in with you once a week. In short, there are various types of apps in this lists which will motivate you, help you track your health, and meet your fitness goals. Maintaining a healthy lifestyle has become more and more difficult in recent times. In a way, the rapid advance in technology especially smartphones and similar devices have made us lazy. We are constantly on our devices and too busy with the all that it has to offer to consider going for a run. However, the very thing that makes you lazy can also help you get in shape. Fitness apps are a great way to motivate yourself to live a healthier lifestyle. Studies have shown that fitness apps use behavioral change techniques. They can be effective at promoting engagement in physical activity. If you are looking to get into shape then fitness apps can help you track your progress. There is nothing more motivating than knowing you are progressing, and with fitness apps, tracking your progress becomes easier, quicker and more fun. Fitness apps are also a great source for workouts and exercise routines as well. There are apps that will give you access to large databases of workouts and exercises, meaning you will never get bored doing the same old workout week after week. Some fitness apps also have communities set up. With communities, you can also get in touch with more experienced people from whom you can get plenty of valuable tips and advice. Then there are apps that allow you to share your fitness stats. Some apps give you the option to post the badge of honor you got for completing that difficult challenge to social media, or the option to share your completed workouts. Fitness apps can help you keep track of your fitness and health easily and more accurately. Here are the best fitness apps that will motivate you to live a healthier lifestyle. If you want to get fit and can’t go to the gym for some reason then it is best to do workouts at home and this is where the FitStar app comes into play. This app creates custom workouts for you based on your fitness level. You start by doing a few workouts with the app and you give it feedback as you go about which exercises were too tough, too easy, or just right. The app records information and creates a fitness routine that is unique to you and challenges you. It is also compatible with a few Fitbit devices as well. Lose It! is a completely free fitness app that is available on various platforms. It is designed for counting calories and logging exercise, can help you lose weight. The app has been around for quite some time and it has an incredibly strong community of supportive people to help you stick to your goals. It is also compatible with several fitness devices and apps, including Nike+ FuelBand, Fitbit devices, Runkeeper, MapMyFitness, and Jawbone UP, so you can import your calorie intake and balance it effortlessly against your calorie expenditure. Map My Fitness is an app that you can use to track over 600 fitness activities. This app provides the widest range of supported activities and lets you track different sports and workouts. It uses GPS to track the routes you travel and shows you a map of the ground you covered when you’re done. It also displays length, in both time and distance, as well as pace, maximum speed, and a few other statistics. However, My Map Fitness keeps some of its features behind a subscription pay, starting at $5.99 per month or $29.99 per year. The subscription is worth the extra features the app provides. Charity miles is a really great fitness app that provides excellent motivation to run. This app lets you earn money for charities each time you go in a run, walk, or use your bicycle. Corporate sponsors donate a few cents for every mile you complete. There are multiple charities available in this app like Save the Children, Alzheimer’s Associations, World Wildlife fund, and a lot more so you can select which charity to support. A few cents might seem insignificant but when a lot of people use Charity Miles, those little bits of money add up. The Cyclemeter app is one of the very best bicycle-ride tracking apps around. This app collects a ton of data, is very accurate, contains several well-thought-out features, and appeals to fitness enthusiasts who participate in more than one sport. This app is also capable of tracking walks, runs, and other activities. It does not include a calorie-counting component, but it is packed with cycling data. Unfortunately, for now, it is only available on iOS. Edomondo is a great tracking app that is available on various operating systems. It is capable of tracking your runs, bike rides, and other outdoor activities with good accuracy and a simple interface. The premium version of the app comes with training plans and coaching features which definitely improve the Endomondo experience. For the premium app, you have the option to pay monthly or yearly at a discounted rate. Sometimes all you need for your fitness routine is some good music to move to and Fit Radio does just that. 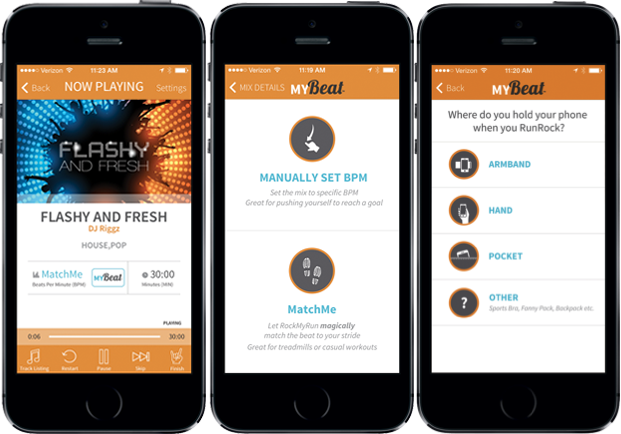 The simple music-streaming app specializes in DJ-created mixes that maintain a consistent beat. The tunes on this app are designed to motivate you and get you excited during your workout. There are several mixes on this app that you can choose from. You can browse mixes by genre, DJ, or a type of workout, such as Spin, Zumba, or yoga. Fit Radio is free to use, but with the free level, you get only one genre of music and only a few mixes. The Fitbit app is best when paired with its own fitness trackers but you don’t actually need a tracker to use the mobile app. Without a tracker, the Fitbit app can count your steps, help you track the calories you consume, log your weight, and record other health information, such as blood pressure and glucose levels. This is another great app that offers various workouts that you can do at home or at the gym. Jefit also helps you keep track of your sets and reps. The Jefit Workout app gives you simple tools for crafting weight-lifting workouts and keeping track of the details as you complete your routines. It is a simple app that gets the job done in a minimalistic way. This is a free app that comes with several workouts and exercises but the star in this app is the 7-minute high-intensity workout that will help you squeeze in some exercise even in the busiest days. The workout requires only a chair and 7 minutes of your time. There are also other lengthier workouts in the app as well. The app coaches you through each move as it comes up in the workout. It’s a great app for people of all ability levels. Asics is a company that manufacturers sneakers and the My Asics app is created by them. This app lets you formulate a training plan for running a race or a marathon. This app is great for beginners as well as seasoned marathon runners. Training is usually a premium feature in other run-tracking apps but this app offers it for free. My Asics isn’t the best at tracking runs, but it gets the job done. The app records your runs and then modifies your plan to suit you. The plan formulated is challenging but adjusted to stay within your reach. This app lets you keep track of what you eat in a simple yet comprehensive manner. MyFitnessPal is a mobile app and website that gives you a wealth of tools for tracking what and how much you eat, and how many calories you burn through activity. The interface and functionality of the app make it easy to manage. It also has one of the largest databases of foods and drinks. With this app, you can track your intake 24/7. If you are looking for a personal fitness coach then you should try the Pear Personal Coach app. This app provides you at-home workouts, yoga routines, and even training programs for running races. Pear features real human voices as the audio guide. The app is free, but in-app purchases can are worth the money. The Android version is called Pear Interactive Coach. RockMyRun is a music fitness ao that lives up to its name. This app changes the tempo of your running music based on your footfalls or heart rate. It also lets you set the tempo of a playlist if you’d rather try to make your feet keep up with the music. All of the playlists don’t have the advanced features but most do. The RockMyRun app offers a free week trial no credit card required. After that, you’ll have to pay $4.99 per month or $35.99 per year to keep using it. The app has a wide range of genres including classical so there is a huge collection to choose from. If you are into running then the Runtastic Pro is a suitable fitness app companion for you. The app allows you to measure and track your runs, walks, and other exercises, but it also acts as a coaching app to motivate you to keep working toward your goals. 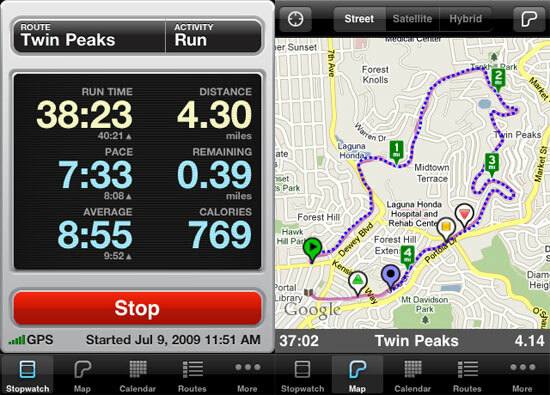 The app will also help you train for races and marathons as well. The $4.99 Pro version is also worthwhile. Runtastic Pro provides you with several features to improve your fitness and ensure that you are enjoying your workout. Additionally, you will be a part of a global fitness community as well where you can achieve extra motivation and tips and tricks from professional coaches to help you reach your fitness goals. The Runtastic Six Pack Abs app is specially designed to help you strengthen your core. This app will guide you through various workouts that will help you get abs. Runtastic Six Pack Abs app is great for both beginners and advanced users. There are several workouts on this app with varying intensities so you can easily find one to suit your needs. It’s a solid coaching app that targets abs through a wide variety of exercise moves. A human voice counts through your sets and reps, while a video of an avatar shows you the correct form for each exercise. There are also training programs available in this app as well. If you are just looking for some great workout tunes then the Spring Running Music app is the one for you. This app supports a number of different activities, including running, walking, interval training, bicycling, and more. It has a huge collection of more than 40,000 songs, as well as some pre-made playlists for workouts. Unfortunately, it is only available for iOS and it is not free. However, with this app, you keep your pace to the beat, and you can change the music’s tempo during your workout if you’re looking to slow down or speed up. This app features rich statistics and is one of the best running apps for data-lovers. Runmeter is highly customizable and it’s Elite membership is also quite affordable. It also collects comprehensive stats. Unfortunately, it is only available for iOS only. The interface is also not very pleasant but aside from that, Runmeter is an excellent app for tracking your route, pace, and many other stats while running. If you are looking for an app that has a bunch of features that will help you track your fitness statistics then look no further because Digifit iCardio is the answer. It is available for both iPhone and Android and it can be paired with any supported heart rate monitor to track your runs, bicycle rides, and other workouts. Not only will it record your heart rate, but it will also keep track of distance, time, and pace. All you need is a good heart rate monitor to utilize this app to the fullest.